Hairy Butterwort (Pinguicula villosa) is a small plant found on relatively dry hummocks in muskegs. 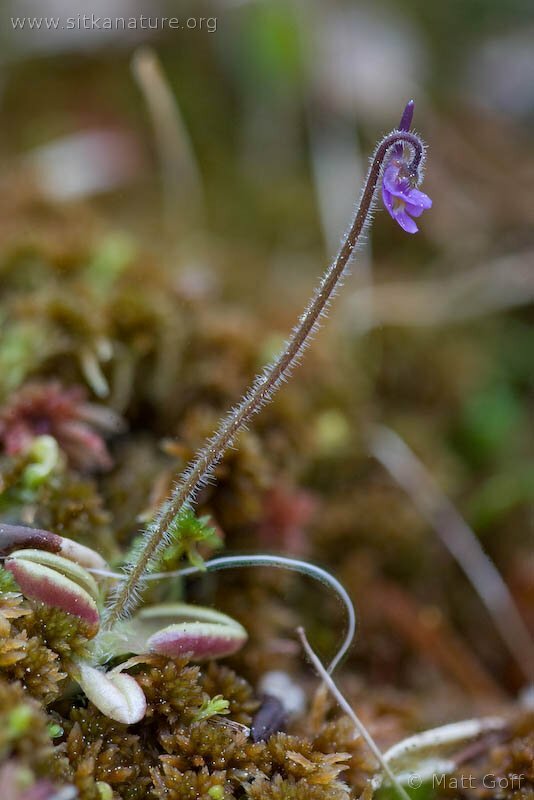 Easy to overlook because of its size, this plant, with its delicate purple flower, is worth the effort to find and take a closer look at. 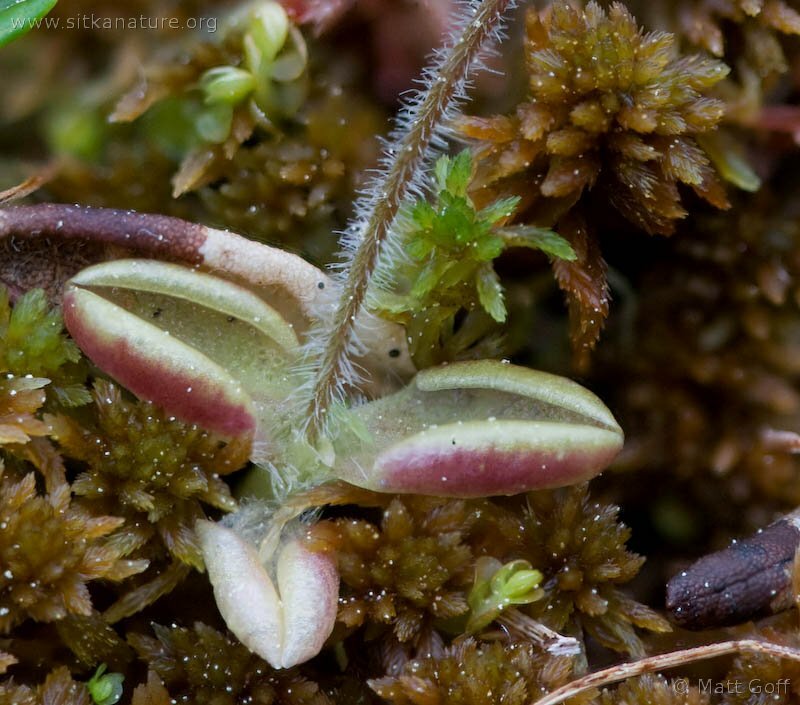 Like its larger and more common relative Common Butterwort (Pinguicula vulgaris), this species is carnivorous. 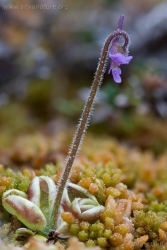 Its leaves are sticky and secrete enzymes which allow it to digest and the nutrients from any insects or pollen that become trapped on the surface. 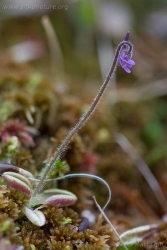 (As a carnivorous plant, it has attracted the attention of people who enjoy growing carnivorous plants, and any seaches for this species on-line will turn up pages about this species and how to grow it.) In order to survive the winter, it forms a hibernaculum (a type of bud) that offers greater protection from the cold. 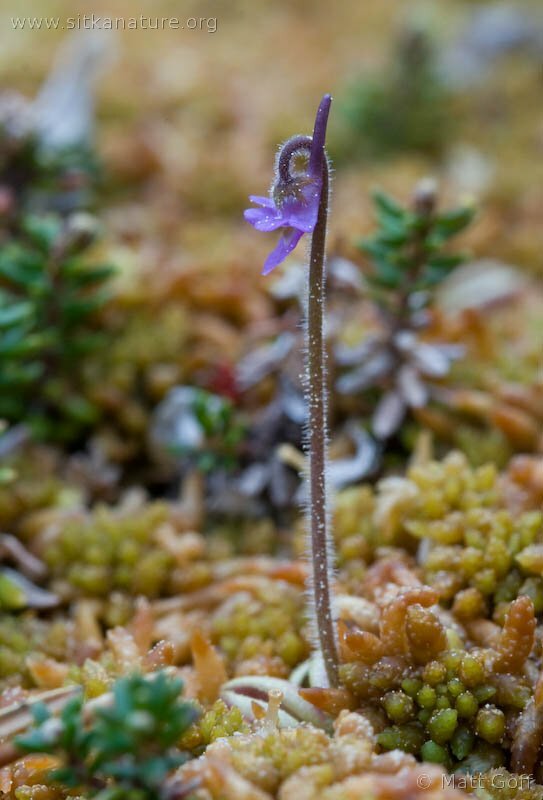 Despite the fact that this species grows in an easily accessible location close to home, last weekend was the first time I had ever observed it, and I almost missed it this time as well. 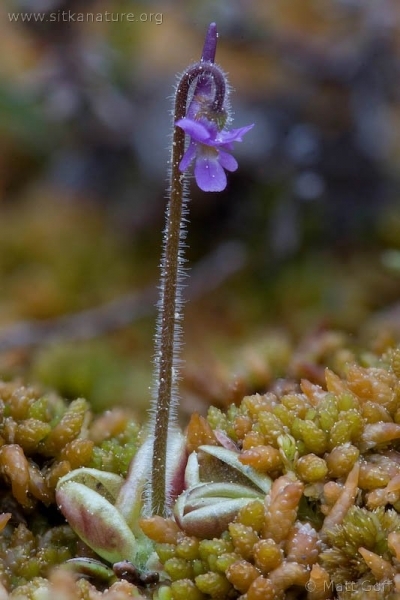 When my brother spent a year here in the 2003-2004, he mentioned finding what he said was a flower that looked like Common Butterwort, but was much smaller. 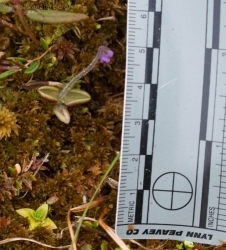 At the time I figured it was probably P. villosa, but I did not get over to the muskeg to see it. In the following year or so I visited the muskeg where he had seen it, but never noticed it myself. Eventually it slipped off my radar, and I didn’t think about it anymore. Last weekend I got a call about a Sandhill Crane that showed up near that muskeg, and since Rowan had not seen one before, she, Connor and I walked over. The crane was gone by the time we got there, but we walked around the muskeg for a little while. On the way home, Connor wast telling me about the flowers he saw (we recently started playing a game where we try to see how many different kinds of wildflowers we can find on a walk), and mentioned seeing a small purple flower. 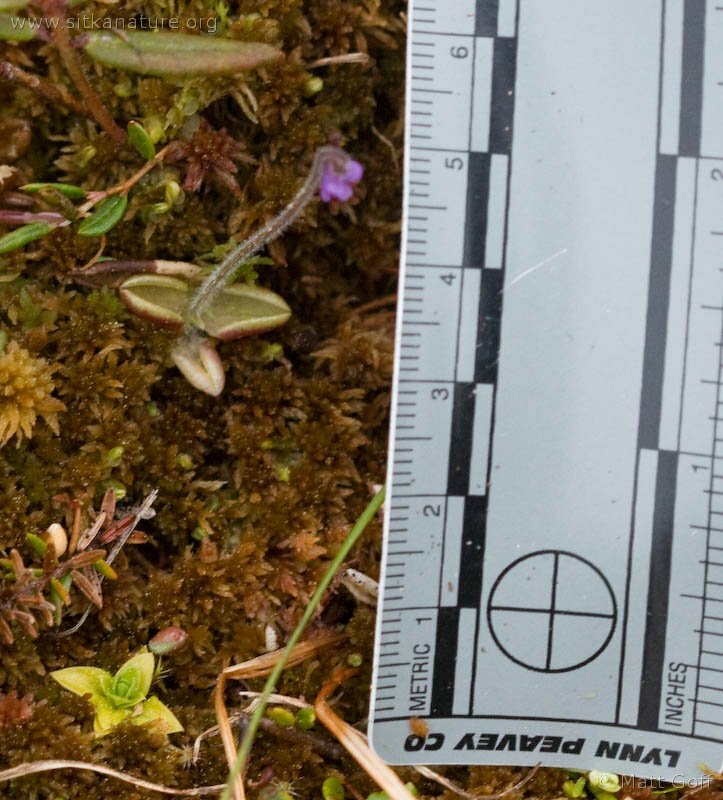 After questioning him about its details, I thought it was likely P. villosa, so when I had time the next day, I walked back over and took the pictures seen with this post. Even after I found the first one and knew what to look for, it was surprisingly easy to overlook additional plants. I took several photos of the second one I found, but only realized after I was done that 3 or 4 more were blooming within a foot of the one I photographed. Profile of P. villosa at pinguicula.org. Article on the genus Pinguicula at Wikipedia. This entry was posted in flora, photo, Species Profile and tagged Muskeg, Pinguicula villosa. Bookmark the permalink.